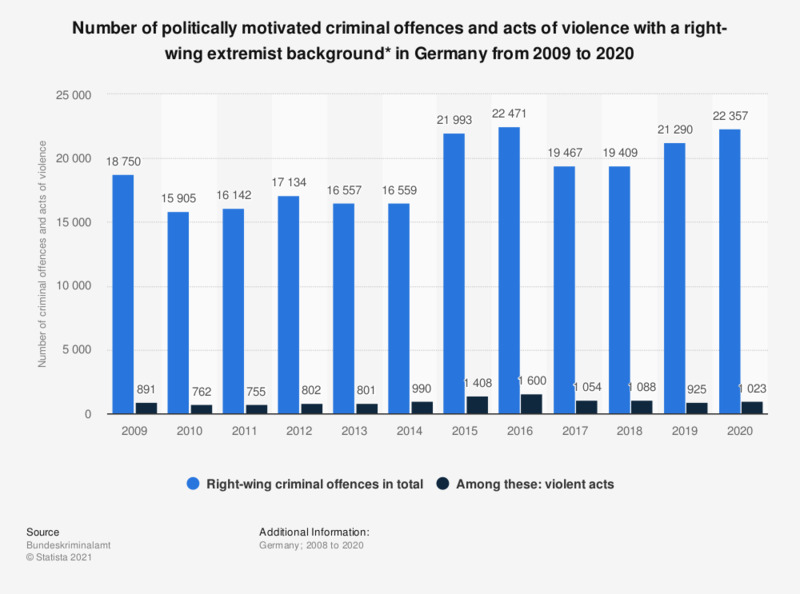 This statistic shows the number of politically motivated criminal offences and acts of violence with a right-wing extremist background in Germany from 2007 to 2017. In 2017, a total of 19,467 right-wing criminal offences were counted, of which 1,054 were violent acts. * Criminal offences with an extremist background connected to right-wing politically motivated crime. This statistic includes completed and attempted criminal offences. Each act was counted only once, according to the source. When, for example, bodily harm was inflicted at the same time as a breach of the peace, only the bodily harm will appear as the offence with the higher threat of punishment in the statistic. If several criminal offences were committed, only the more heavily punishable offence was counted. Figures for 2015 were retrieved from earlier issues of the Defense of the Constitution Report.